BradProof® is a water-based treatment that will restore a water repellent finish and inhibit mildew growth on used canvas goods. Comes in a 2 litre container. Approximately will do 12 square metres. BradProof will slightly whiten dark colours. Apply with sponge mop, brush or roller. Best results and easier application are achieved when the article is in a taut position – items such as tents or annexes should be erected with doorways and windows closed. Where this is not possible, spread on a clean surface. Remove any dust or dirt by lightly brushing. Severe soiling should be removed with clean, warm water – do not use any soap, detergent or other cleaning agents. For mildewed fabric, a pretreatment with sodium hypochlorite bleach** (diluted 1 part bleach to 3 parts water) is recommended to remove growth and spores (be sure to carefully read and follow any safety directions outlined by the bleach supplier). Before applying bleach, check the fabric colour is not affected by applying a small amount of the diluted solution to an inconspicuous part of the fabric. Apply diluted solution to canvas with a soft brush. Allow to sit for 15 minutes then RINSE THOROUGHLY – insufficient rinsing may result in fabric damage and interfere with water repellency. 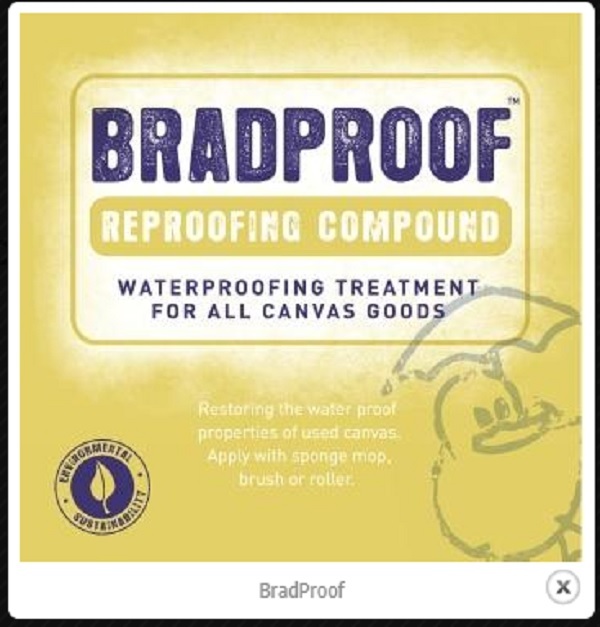 Allow item to dry completely before applying BradProof® WATER PROOFING TREATMENT. *This product has been formulated to improve water repellency and inhibit mildew growth however the manufacturers cannot accept responsibility for results obtained as both the pretreatment conditions and the method of application are beyond their control. Read all directions carefully before commencing. Work outdoors, or in a well-ventilated area. elect a warm, sunny day to apply treatment. Some settling of the compound may occur. Ensure that the compound is thoroughly mixed before use. SHAKE WELL. BradProof® will slightly whiten colour of fabric (particularly dark colours). Test the effects in an inconspicuous area and allow to dry before assessing results. Where a colour change is not acceptable and mildew is not present, BrellaGuard® BIONIC TREATMENT is recommended. Compound can be applied with a sponge mop, cloth swab, brush or roller. Apply the compound evenly to both sides of the canvas (unless fabric is striped or patterned, when only the underside should be coated to avoid impairment of the pattern). For maximum effectiveness, allow to dry completely before exposing to moisture, or folding and storing the article. Approximately 48 hours if allowed to dry in warm, sunny conditions. Wash brushes and rollers etc, in water. Depending on fabric weight, 1 litre will treat approximately 6 square metres (underside only) or 3 square metres (if both sides of fabric are treated).  Keep out of children’s reach.  Dangerous if swallowed, inhaled or absorbed.  Avoid contact with skin and eyes.  Work in a well-ventilated area.  Do not treat tents, annexes etc, from the inside and allow to dry completely before occupying.  If swallowed, do NOT induce vomiting, but give plenty of water or milk and contact doctor or Poisons Information Centre immediately.  If contact with skin, wash affected areas with soap and plenty of water.  If in eyes, flush with water for 15 minutes and seek medical attention.